It's the last day of Fashion Week at GLOGIRLY. Next week it's all sweatpants and slippers. 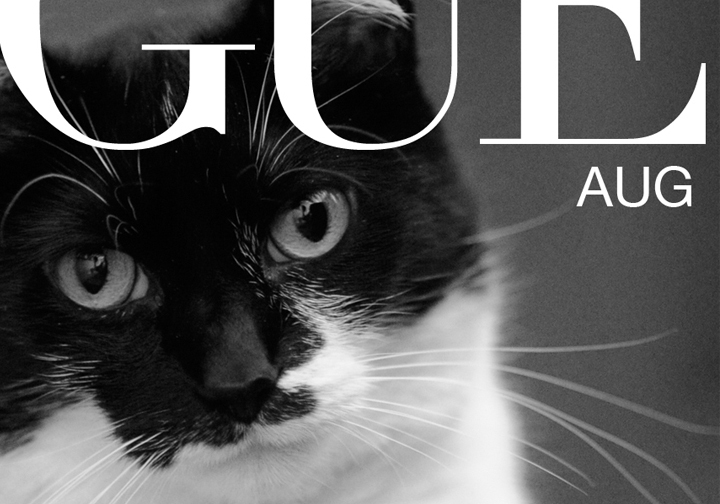 When Glogirly and I think of fashion, we can help but think of Vogue. It's such a beautiful word. It's a noun, it's a verb, it's a name. And it's AWLAYS in style. Kind of like us kitties. Isn't it nice that no matter what the season, the trend, the latest fad....we are all classic beauties. We never go out of style. ...and our furs never need dry cleaning. Lovely lovely girl, you'll never go out of vogue! 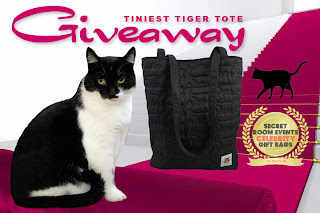 Especially us tuxie girls. Always ready in our "lil black dress". - kissies from Precious. You rock the Vogue Katie! you're a classic Beauty Katie! Miss Katie, you ARE beauty! You're simply the best ! Classic Beauties. What a lovely phrase. And soooo true! Especially you, sweet Katie! Katie, black & white looks good on you! YOu are, as Patty above me there said, Vogue perkittiefied! The best Vogue cover EVER! katie; haz ewe ever wundered why there iz knot a magazeen called like mackeral....ore even salmon.....enjoy yur week oh end !! 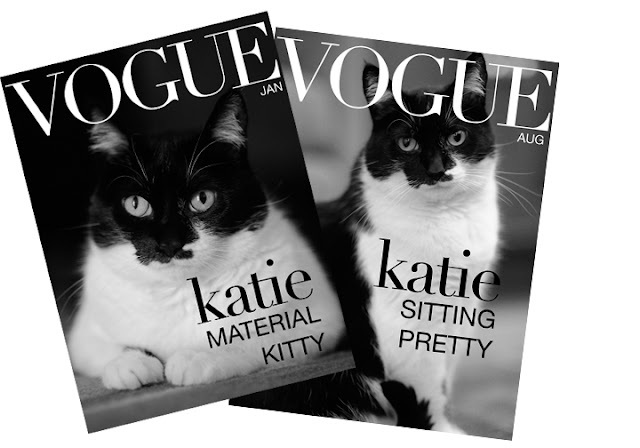 Katie you're purrect on the Vogue showing off your tuxie coat in classic black and white. Beautiful beautiful! You'll never go out of style, bestie! You are a cover girl! I have to tell you that Brad has fainted, right here as I write this. Drowned in the presence of beauty, I must say.....have some pity for this boy, ok? purrrr....meow! Allie: Of COURSE! But then again, *any* photo of you is like "striking a pose". Gloman must LOVE his photo sessions! You are so much more beauteous than those anorexic little 14 year olds that usually grace the cover of the rag-trade mags! !